Joey is a uOttawa Human Kinetics graduate who also earned a Master’s of Kinesiology from the University of Calgary and holds a CSCS (Certified Strength & Conditioning Specialist) designation from the NSCA (National Strength & Conditioning Association). Joey has been working as a performance coach for over 10 years. During this time Joey has worked with a multitude of Elite level High School athletes , CIS/USport athletes and professional athletes with notable tenures with the University of Calgary Dinos Football team (4 years), the Calgary Stampeders (6 years) of the CFL, the uOttawa Gee-Gees Football (7 years) and WRugby (4 years) teams, the Ottawa RedBlacks (2 years) of the CFL and most recently Joey has worked for the last 18 months as the uOttawa Gee-Gees Varsity Lead Performance Coach responsible for all 10 Gee-Gee Varsity Teams consisting of over 400 U Sport athletes as well as developing an internship program which develops 20+ aspiring performance coaches yearly. Furthermore, Joey has been managing and operating performance businesses for over 10 years. Joey started in Calgary with NSD (National Sports Development) where he managed the football department. Joey went on to start his own business called KING Football in Calgary which he later expanded to Ottawa and changed the name to KING Athletics. Most recently Joey worked for the past 3 years as the Performance Director for Human 2.0 in Ottawa. Joey will now be working as the General Manager at Titan Performance responsible for Business, Staff & Program development. Brendan is a professional athlete who plays in the CFL (Canadian Football League) for the Ottawa REDBLACKS. He has played professionally for 4 years after graduating from the University of Ottawa in 2013 as an All-Canadian athlete. Brendan graduated uOttawa with a degree in Human Kinetics and holds a CSCS (Certified Strength & Conditioning Specialist) designation from the NSCA (National Strength & Conditioning Association). Brendan has worked in the fitness industry for 6 years and has experience with both personal training and high performance group settings. He has worked with a diverse clientele ranging from young athletes, multi-sport high school athletes, USports teams (rugby, swimming, football), to professional athletes. Brendan has also dedicated time to coaching football and works with a number of teams in Ottawa ranging from young amateur football to guest coaching with the University of Ottawa GeeGees. Brendan utilizes a “practice what you preach” philosophy balancing his own training, nutrition, and lifestyle with his coaching. He favours research-based proven techniques in order to develop a holistic athletic foundation which can then be used alongside sport-specific skills and utilized on the field or arena of play. Margaret Hughes is a Sport Dietitian who holds a Bachelor of Science in Chemistry and a Bachelor of Science in Human Nutrition from St. Francis Xavier University and a Masters in Education from the University of Ottawa. She holds distinction as a Sport Dietitian through completion of the world renowned International Olympic Committee’s Graduate Diploma in Sport Nutrition. Margaret has extensive experience working with various competitive athletes and clubs in Ottawa. 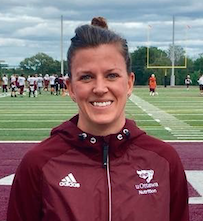 She is currently the Lead Performance Dietitian at the University of Ottawa, and is currently working with Gatorade Sport Science Institute as a consultant for the Raptors 905 in Toronto, ON. She is a former dual sport varsity athlete and believes that nutrition plays a key role in athletic performance and recovery.